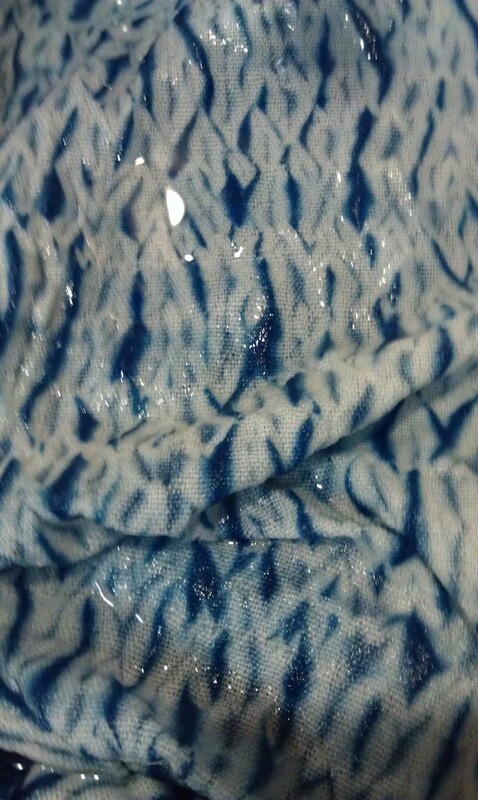 Woven shibori in rinse water. The old year went out not at all as I had planned, and I’m attempting to start this new year by making good on a few resolutions. On Dec. 26 I received an email, which I didn’t see until the 28th, from Hand/Eye Magazine (online) asking if I would like to contribute a piece to be published. My work had been seen on TAFA – The Textile and Fiber Arts List. The deadline was January 2nd as the next publication date was today, January 4th. After my initial shock I replied yes, and the next day was thinking about what I could possibly write, followed by three days of rewrites, revisions, tweaks, and locating photos, all sent off to the editor just before 9 PM on January 1st. My thanks to Rebeca Schiller, Hand/Eye Online Editor, for this opportunity! The article is titled “Mystery Weaves.” An exciting way to begin the new year! Visit Hand/Eye Magazine at http://handeyemagazine.com. I’ve spent days thinking about what I would like to weave and accomplish in 2018, what to continue, what new areas to try. Lists are in progress, deadlines are on the calendar, and it is a matter of keeping it fun, interesting, and a healthy dose of self-discipline to make it all happen, something I was lacking last year. It is time to change that! Woven shibori and embellishment possibilities.Years ago someone I knew told me I needed to focus on ONE area of weaving, forget everything else, create a body of work in ONE area, create my own style. 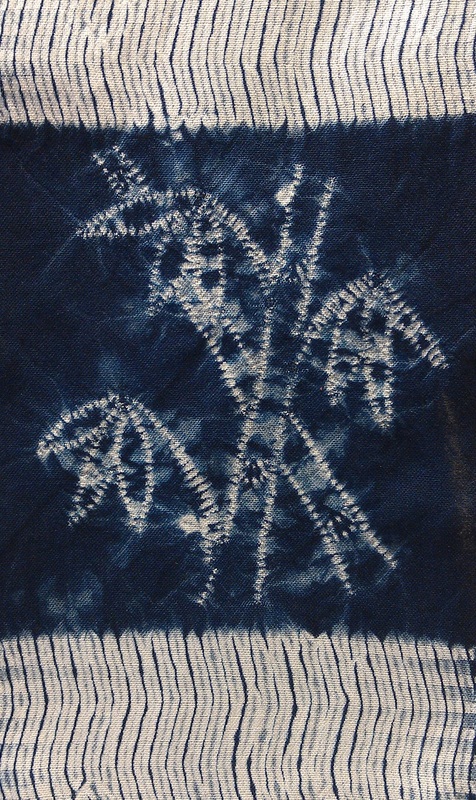 I’ve never forgotten that discussion, and that is what I’ve been attempting with woven shibori. I will be continuing to explore that technique in scarves/cowls and other items that I sell. I also hope to take it in areas new-to-me, larger works, and continue that body of work on a new level. I will also be incorporating some Norwegian/Scandinavian weaving, into my year. And by “Scandinavian,” I a using that word in a very broad sense. Traditional and contem- porary are both of interest, as are the looms/traditions. My drawloom has long been neglected and that must change. 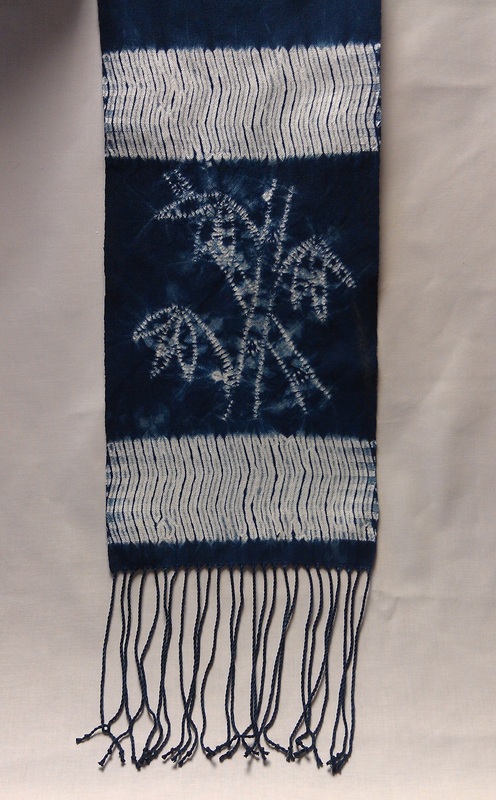 And woven shibori can be woven on a drawloom! A Rosepath table runner, I wove long, long ago. 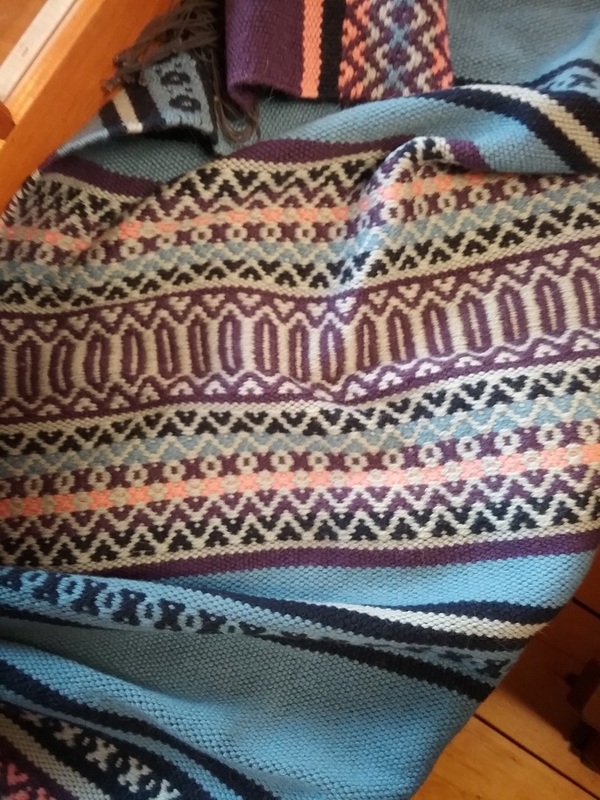 This table runner was woven from a project/recipe in a Swedish weaving book. It has a seine twine warp, and was woven with Berga wool weft yarn from Sweden. 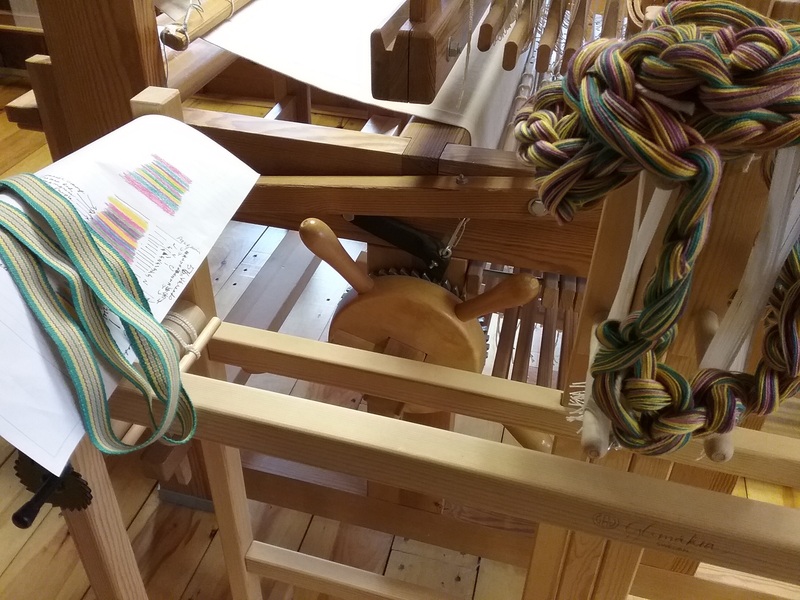 Bandweaving, particularly Scandinavian, has become a stronger interest,… plain weave bands, inkle, Norwegian pick-up, Sami, tablet weaving, so many areas that can be explored over time, and again, can be used in combination with other types of weaving. Right now, I need more plain weave bands to use in the studio. For example, to tie the trapeze uprights to the loom to stabilize them, my preference over clamps. New color sequence for a plain weave band, ready to beam. At the same time, I rebel against being told to only have one interest and work only in it. I have never been able to do just ONE thing! I like to learn, and tapestry weaving has long been at the top of my list. This may not go anywhere beyond learning basics , or may go into some depth, but until I try, I will never know if I could learn it, become competent. Many, many years ago, knowing nothing about tapestry, I warped a Schacht tabletop tapestry loom with navajo wool warp, spun and plied the yarns, and wove two small tapestries. That was the beginning of my wanting to learn more. Two tapestries woven on Navajo wool warp, using my own handspun yarns for weft. I know I’ve mentoned it on this blog perhaps two or three years ago. 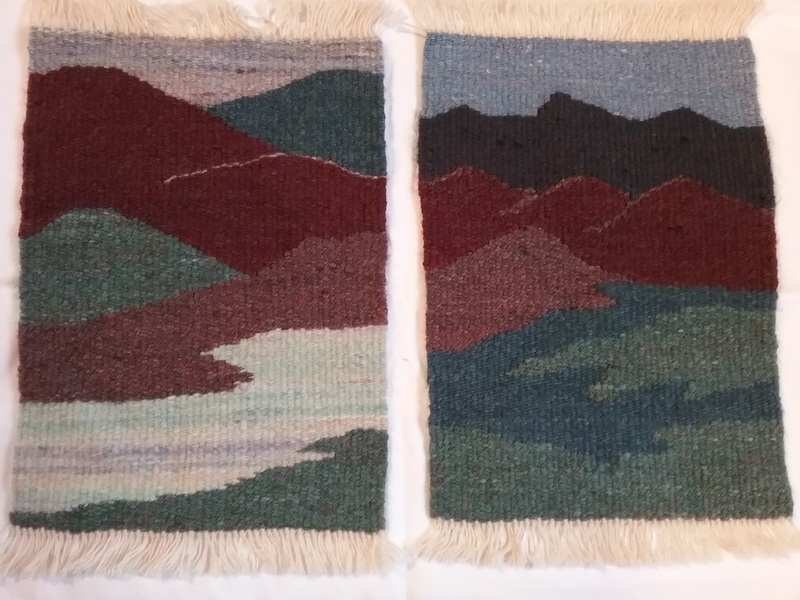 After years of searching I even found and purchased a Regina tapestry/rug loom nearly three years ago, signed up for Rebecca Mezoff’s 3-in-1 tapestry classes, began working through it, then put the entire thing on hold. Some people just dive into new ideas and projects, I quite often seem to need time, often a large chunk of time before beginning. I believe it is mostly fear or failure. Well, the time has come to sit down at the loom and begin. I’ll share the good, bad, and ugly with you. I have added a medium Hokett loom and signed up for Rebecca’s Small Tapestry class. Also a Mirrix Zach loom, so I have no more excuses. Tapestry weaving will be for my own enjoyment and learning. And now, it is time to make a warp for new woven shibori scarves, I have new ideas to try! My Woven Shibori works, as well as Scandinavian weaving will again be available at Eagle River Gallery, 836 W. Pine Street, Eagle River, WI. Please check this link for days and hours open. The gallery will be on the Northwoods Art Tour in 2018, July 27-28-29, and Oct. 5-6-7, 10 AM to 5 PM. Gallery artists will be present on these dates providing demonstrations of their arts. I will also have work again very soon in my online Shuttle Works Studio shop on Big Cartel. I will also have five Open Studio weekend,… May 19-20, June 16-17, July 14-15, Aug. 18-19, and Sept. 15-16, 10 AM to 5 PM. Shuttle Works Studio is a working weaving studio with several Glimakra looms, as well as spinning wheels, and a 1908 Gearthart sock machine. Demonstrations will be available on those weekends. The only thing that would remove these dates is if my home/studio sells, and I move during that time period. When that happens there will be a big announcement on the Home Page, my FB Page and more. I suggest before driving any distance, just make a quick check to confirm the date you were planning to visit is listed. Otherwise, I will be here, weaving! 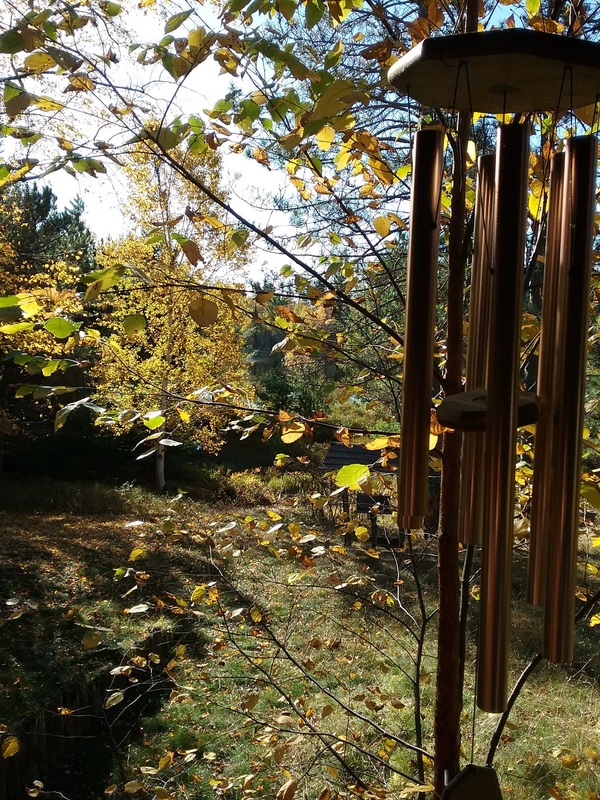 Home and studio, in Autumn. My word, I’ve been away from this blog for a long time, so it is time to remedy that. 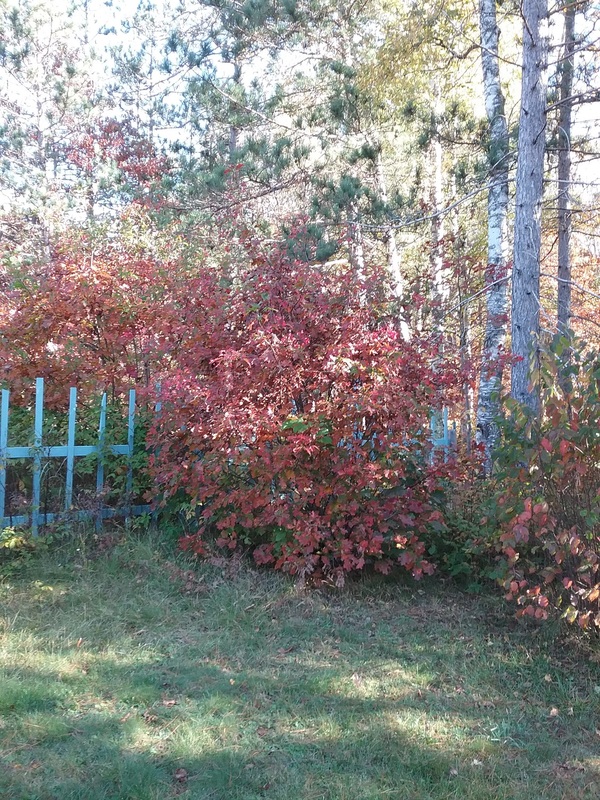 It is mid-October, getting to be late autumn in the WI Northwoods. After a couple brief periods of unusually warm temps for this time of year, we have now settled down into cool, crisp days, and frost warnings some nights. 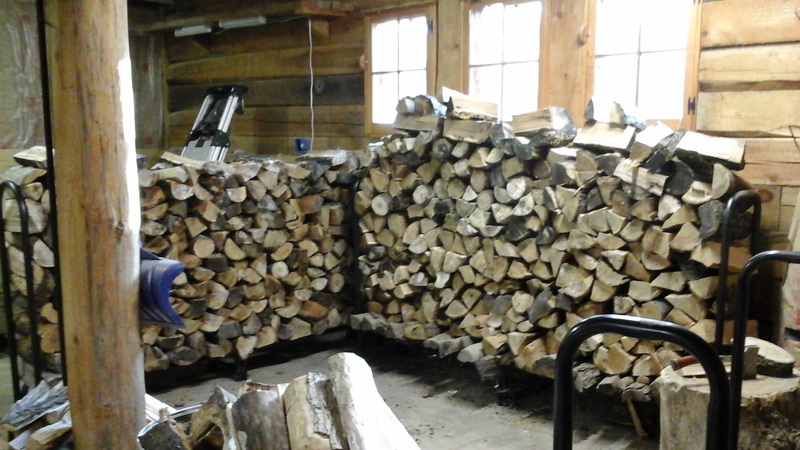 The cooler temps are a reminder that snow is coming and there is outdoor work to be done, including splitting wood for the kitchen woodburning range, before the snows arrive. View from the lakeside porch. Back in February I had cataract surgery on my right eye, followed by a few restrictions, in the dead of winter,… no snow shoveling, no carrying wood, no chopping ice, which was then followed by inflammation and more drops. This was over a couple months. A new right lens in my glasses and I was told my vision was 20/20. 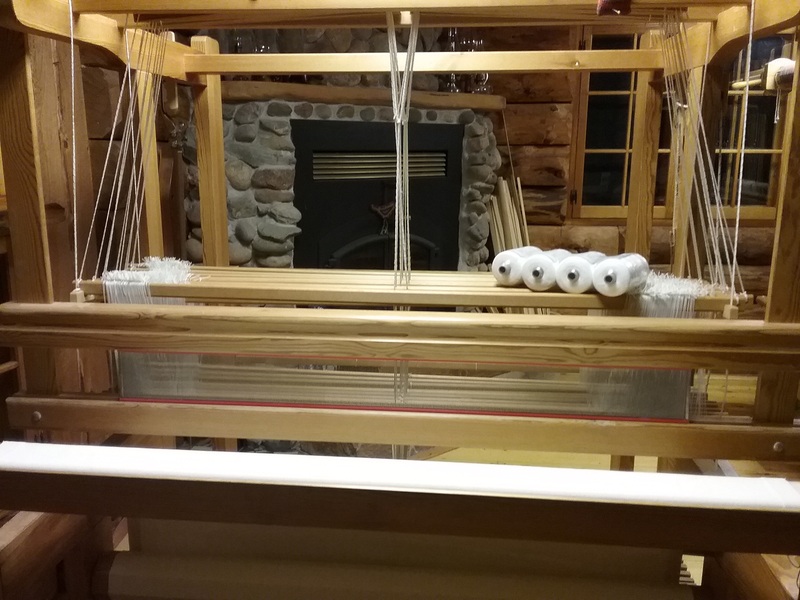 I could decide before the surgery where I wanted my focus to be, so I decided the fell line on the loom would be good, 16″ from eyes to that point. Except, in the words of the opthomologist, “your eyes didn’t cooperate with our computer model.” It ended up more like 10,” so I can read my tablet and books fine, up close, without glasses, but the fell line and beyond is fuzzy, and reading my laptop screen is a challenge. The left eye wasn’t yet bad enough to change my vision/ability to see, so she wanted to wait. I called regarding an October re-visit and was told she was leaving that clinic in two weeks, someone else would have to see me. Then I was told I couldn’t get in to see him until late February. Wonderful, because for the past month my vision is getting fuzzy again. I tell you, getting two cataracts taken care of should not take up 1.5 years of anyone’s life. So, I’d been procrastinating for months, needing time to think about my future, the rut I felt like I was in, and trying to balance commitments with determining what I want in the coming years. I am not young, and in another week will be another year older. I had pretty much come to a standstill with everything in my life, but happily now getting out of that rut and back into the studio, ready, well, ready in a couple days, to weave and create again. I’m having an open studio this weekend (Sat. & Sun., Oct. 14-15, 10 AM to 5 PM) and the studio is nowhere near ready. I’m expecting perhaps two people, if they want to make the trip down from the UP, a woman who wants to take up weaving and wanted to visit and see/try my looms. 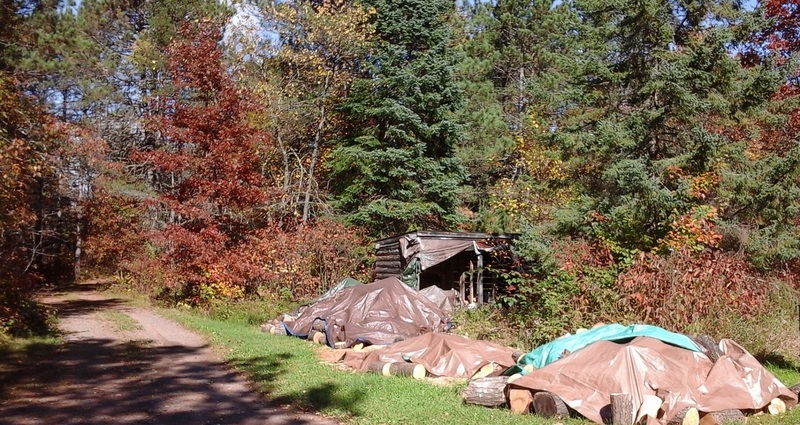 I haven’t advertised it much, and tourist season is over in the WI Northwoods. I couldn’t schedule it last weekend, no one would have stopped by as it was Cranberry Fest weekend, I was demo’ing the sock machine at Eagle River Gallery for three days, and it was also the Northwoods Art Tour. Hence, postponing it to this weekend, rain or shine. Whether anyone stops by or not, I’ll be working at the looms, perhaps a bit of spinning, and there are socks to be made. Tonight, I’m finishing up some cleaning in my studio, wiping dust off looms, noticing that after this warp I’ll be taking all the heddles off the Glimakra Standard and giving them a wash and rinse in the kitchen sink, they have turned a not-so-lovely shade of light gray. I’m also decluttering, … moving boxes that had been packed for a possible move next year, moving spinning wheels upstairs, leaving one in the studio. Tubes of 16/2 Bockens Cotton from Sweden, for more woven shibori scarves, which reminds me, I need to revive the indigo vats early this coming week. Bags of fleece waiting to be washed, carded, and spun. 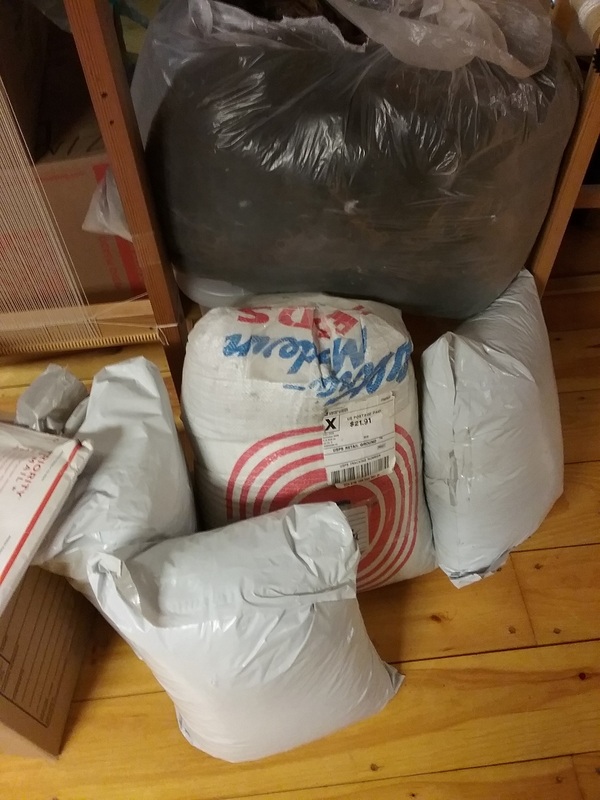 There are packages of fleece that I’ve ordered waiting to be washed, not to mention two big bags of alpaca that my younger daughter brought here months ago, possibly last year? They all need to be removed, too, temporarily. 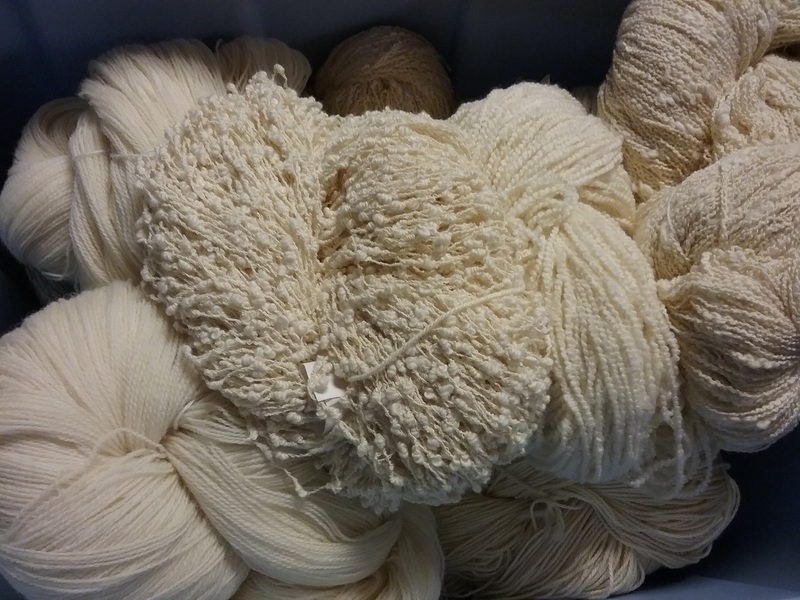 I opened a bin I’d moved to the studio, with beautiful Henry’s Attic yarns purchased in the early 1980’s, just as fresh, clean, and beautful as the day I bought them. They are whispering, calling to me, and I have a project in mind. Towels waiting to be woven. This picture does not show the true colors of the navy and variegated blues yarn, that will become towels for MY kitchen. More towels waiting to be woven. A few years back I did a series of towels, using bleached and natural Swedish cottolin, 22/2. Some towels were 100% cottolin, others, I used different wefts from those large cones on the top shelf. There will be more of those towels, also for my kitchen, and likely some for the Eagle River Gallery next spring. As you can see, there is a LOT of weft to use up! 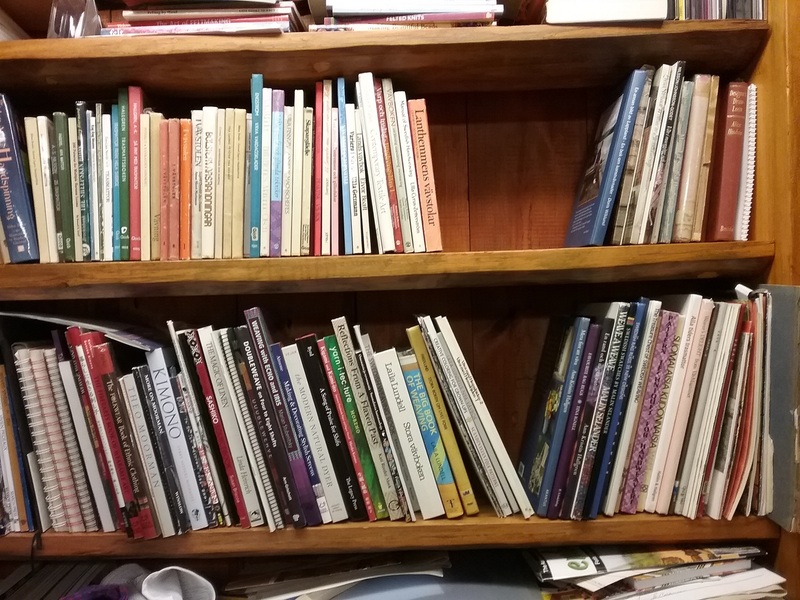 Over the past few months, quite a number of weaving books migrated up to the living room, and now must be carried back down and re-shelved. And last, but not least, the 1908 Gearhart sock machine seems to be workiing better again, though still a bit temperamental. I did get two pairs of socks made this past weekend, so hopefully the sock-making drought is over and that will be more to accomplish this winter. So, back to the studio, where, to finish the cleaning up and decluttering. Then, I need to make a warp yet tonight (it’s 11:02 PM right now), that should have been on the loom a couple days ago. I may be up all night, but whatever, I need to get these things done. 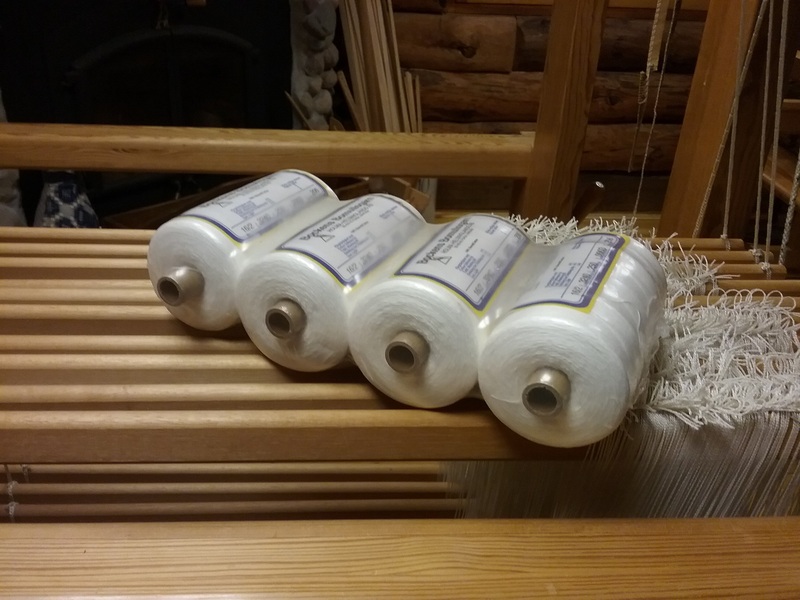 I ordered a warping trapeze awhile back, it’s time to give it a try, then get the warp threaded, sleyed, and tied on, so I can begin more woven shibori scarves. After that, I am finding a new focus in my weaving, to new-to-me areas, which I’m really looking forward to trying. They may or may not work, but it’s good to try new things and keep learning! It’s late, there is an entire night of work ahead of me, and a little sleep much later would be nice. I’ll be back! Ready to pin under a goo light. A couple months ago, or more, I was trying to finish one of those never-ending warps, and I had what I hoped were two scarves, Because I hadn’t made notes, and didn’t remember if I’d left warp for fringe at the beginning or not, I mistakenly didn’t on the second end, of both, Wrong! I ended up with two cowls, which is fine, not everyone likes the longer scarves or fringe, even when nicely finished with hand-twisted fringe. The almost-cowls have been waiting a long time so tonight, very late, I sat down and took care of the seams, my variation of a flat-fell seam. After machine-stitching both edges, about 1/8″ from the edge, to prevent raveling, and wrong sides together, I off-set the two, and machine stitch about 1/8″ from cut edge. If they were lined up, I would have to trim the one down to 1/8″ inch, this way I don’t need to use scissors close to the handwoven. threads. 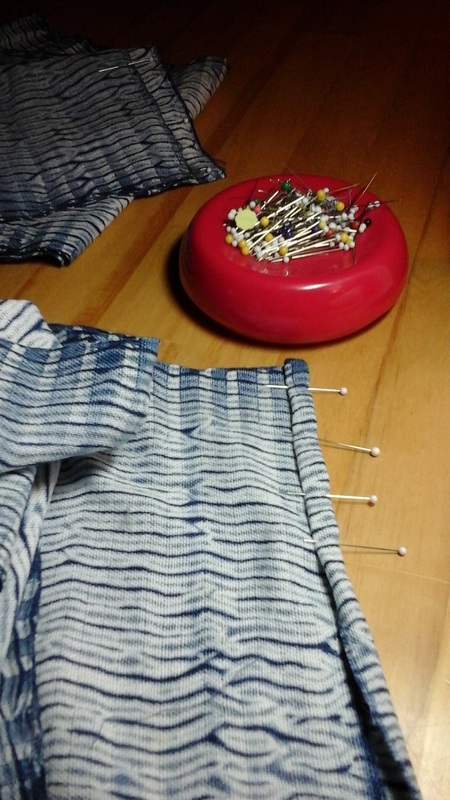 Fold over fabric and pin. Now the fabric is folded over, enclosing the raw edge, and is stitched down. Then I open the scarf, lay the seam down and machine stitch again (sorry, forgot to take a photo). It makes a nice seam, three layers of fabric, not including the little bit of raw edge that is enclosed. On these two, I did not give it a half-turn, mobius style. Cowl, ready to be worn. I was going to add small beads to the edge of one of these two cowls, but my cataracts have gotten worse and threading a needle has gotten to be a challenge. Beads will have to wait a few weeks. The cataracts are one of the reasons I haven’t been doing much weaving recently. My right eye is worse than the left. I’ve had to enlarge print on my laptop screen again, and can’t really read print on the TV screen (Netflix program descriptions, for example). Because things are blurry, I was getting little loops on my formerly nice selvedges. I couldn’t see those little loops unless I took my glasses off and looked closely, not easy to do while weaving. Thankfully, surgery has been scheduled in early February, and I’m hoping the second one will also be in February. It will be nice to see more clearly again. I’m told I will still need glasses since my right eye has a “wrinkle” on the back side, but I won’t complain about that. I just want to see again to get back to my weaving, be able to read, thread a needle, and all the things we take for granted. I know these photos are a bit blurry, too. Between using my tablet to take them, a bit of shakiness, and the cataracts, I end up taking many photos of the same thing, then going through them and choosing what looks to be the clearest to my eyes. Growing stack of indigo dyed swatches. Before immersing my handwoven scarves and cowls in the indigo vats, I “test” the color with small swatches of PFD cotton. These (above) are what I have left after using several for sachets. I try to get various shades of indigo, some solids, some mottled, by scrunching the fabric up in my gloved hand and immersing it once or twice, different lengths of time. They are being used for smaller items. 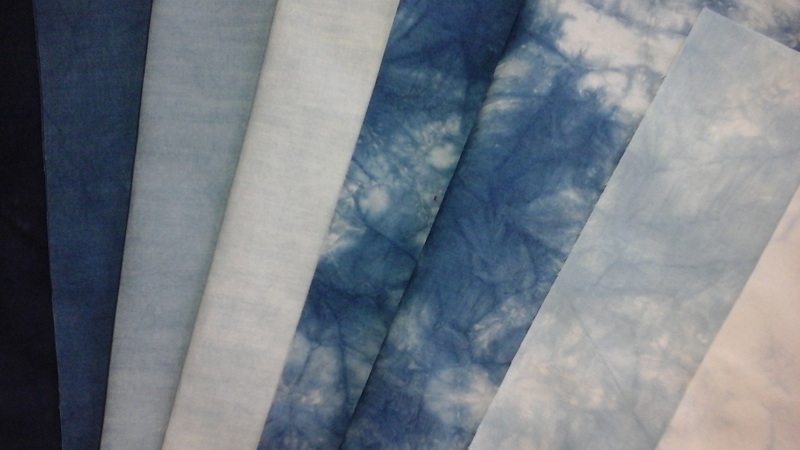 When I have more specific ideas and plans, I’ll do some proper shibori. I’m finishing weaving a warp, hoping it is long enough for a scarf and fringe, so I can hand-stitch a design on, then indigo dye. Hopefully I will get it completed before the cataract surgery and show it here. If I do an overall free design instead of just on borders, it will take longer to stitch/gather/tie before dyeing. I’d like to have a new warp on the Glimakra Standard before the surgery, too, so when I can see well enough, I can sit an weave again. So that warp and ideas for the scarves are in the planning/sketching stage. If you have followed my blog for three years or so, you know I have a lot of Coopworth roving that I was spinning during two Spinzilla’s. With that, I knit a cowl for myself. 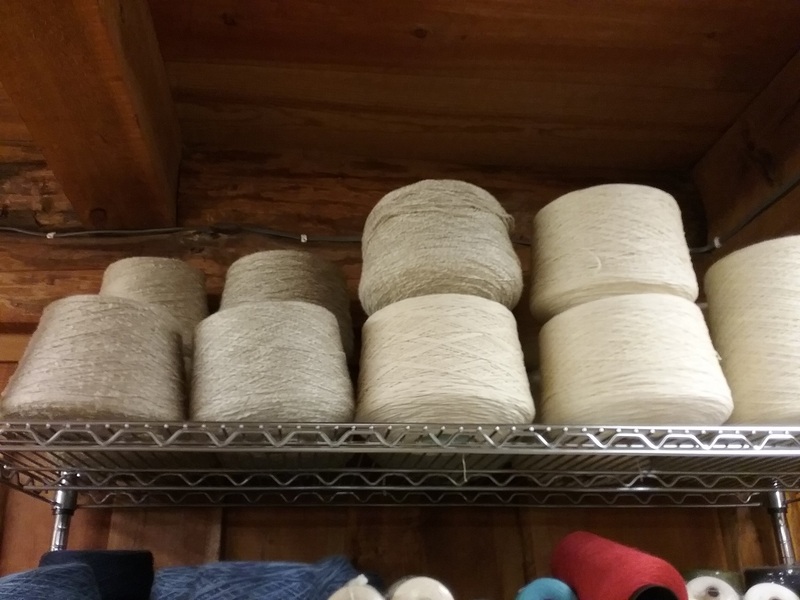 About three weeks ago, I looked at a partial ball of that 2 ply yarn, wondering what I could do with it. A hat! I’d o the same “pattern” from the cowl pattern but make a hat. I started it, making it up as I went alone, and it was a little too small, so unraveled and started over. Now, it might be a little too big. If that is the case, I’ll have the pleasure of knitting it twice. Coopworth roving, spun into 2-ply, becoming a hat. I knit until I ran out of yarn, and need to search my studio to see if there is another skein of this 2 ply. If not, I’ll be spinning more and plying more. Yes, there is still more roving. It was a big, clear, trash bag filled with beautifully coiled roving. I’ve enjoyed working with it so much that I bought a Coopworth fleece a couple weeks ago. Lighter in color, I need to wash it to find out exactly what it will be, and the staples are 3″ to 3.5″ in length so I’ll be able to hand card it before spinning. Three weeks or so before that, I saw a Gotland fleece on a FB raw fleece sales group, silvery gray, and ordered it. Before it arrived, another was listed, similar in color, by the same seller, an that was ordered, too. I’ve never washed/carded/spun/knit with Gotland before so I’m looking forward to that. There will be photos in future blog posts. “Handwoven Tape” by Susan Faulkner Weaver. This book had been in my Amazon cart for months before publication and release near the end of December. I wanted to learn about the history of tape looms, and because I’d bought a tape loom back in November because it was small and very portable. 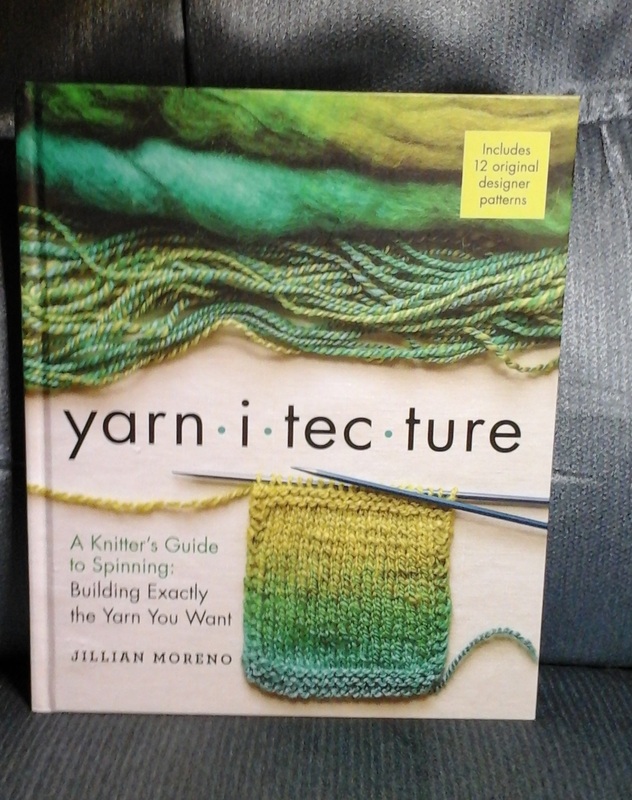 It’s a lovely book, good history and photos of many different styles of tape looms, and I’m looking forward to reading it an putting it to use. 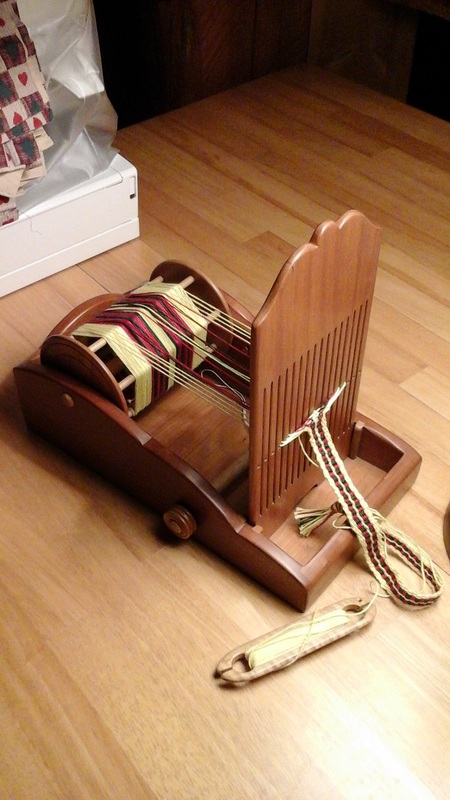 My Glimakra bandloom warp was finished about three weeks ago or so, and is in need of a new warp. 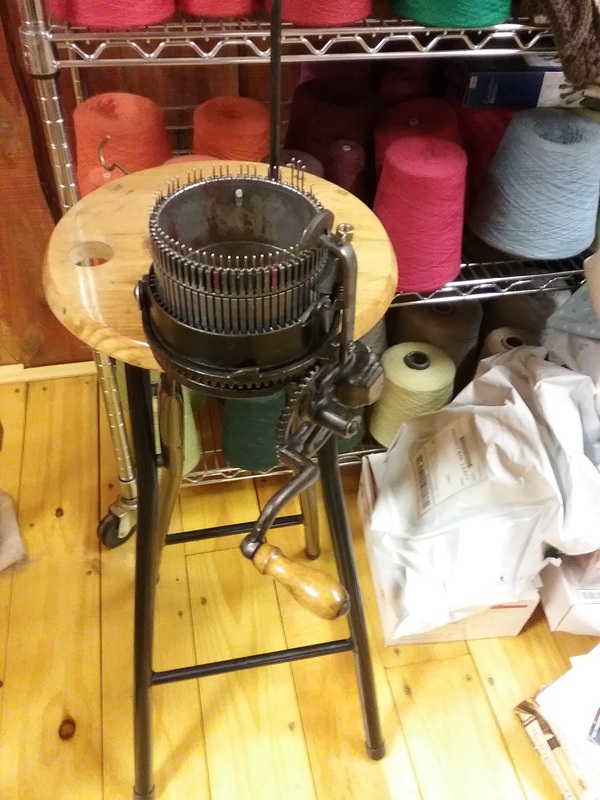 I recently added a warping trapeze to my weaving studio equipment so I will be able to warp my looms alone. I recalled Becky Ashenden, at Vavstuga, had tied the uprights of her trapeze to the loom with handwoven bands. I have one, now need another soon. 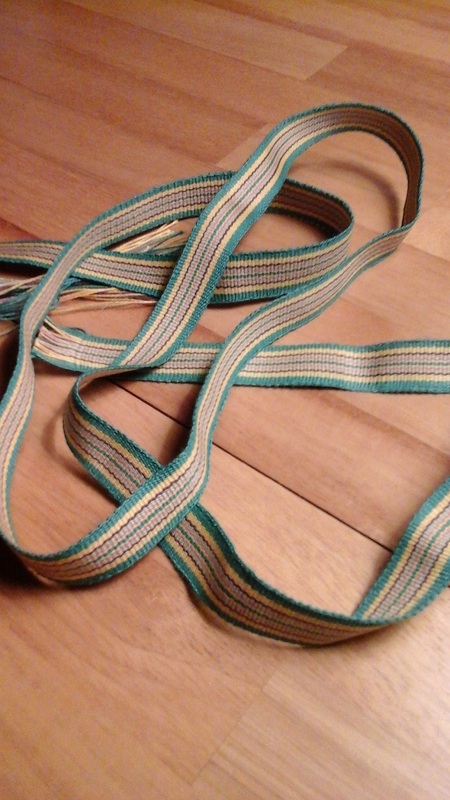 I know I can use clamps, or bungee cords, but prefer the idea of using handwoven bands. Meanwhile, I am looking ahead to the weaving I want to accomplish in 2017, once I get past the cataract surgery, including a couple new (to me) directions to take my woven shibori in. I’m very excited about the possibilities, and the learning curve! Winter has also been keeping me busy, shoveling snow, clearing in front of my garage for doors that open out, not up, raking snow off the roof, and chopping inches of ice that has formed when it warms up. I hope you are all doing well, wherever you are in the world, and are weaving up a storm! 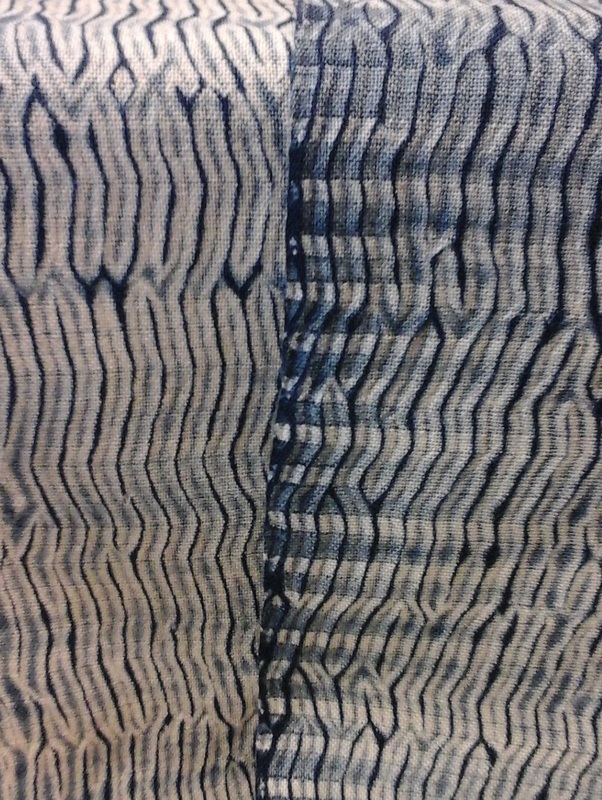 Woven shibori, indigo-dyed, two scarves nearing completion. This photo is of the two scarves written about in the previous post. Actually, they will be cowls as soon as I sew a flat-fell type seam on each. 3 loggers cords or more of wood was cut and waiting to be split and stacked. It feels like a long time since I’ve done much weaving, partly because of fall/winter preparations. I should have been splitting wood for the past month, but my log splitter has broken down twice, parts ordered, partly repaired, only to find not all parts were sent and one piece didn’t fit. So, waiting on parts again. I have the awful feeling I’ll be out splitting wood long after the snow finally comes. Two double wood racks full, in the garage. We did manage to get these two double racks full of split wood, in my garage, and there is another single rack for kindling, along with three or four trash cans full of short ends and other small chunks. There are oil lamps ready, candles, I’ll have extra food in the house along with drinking water for occasions when the power goes out, extra pet food on hand, too, for my three cats and one dog. 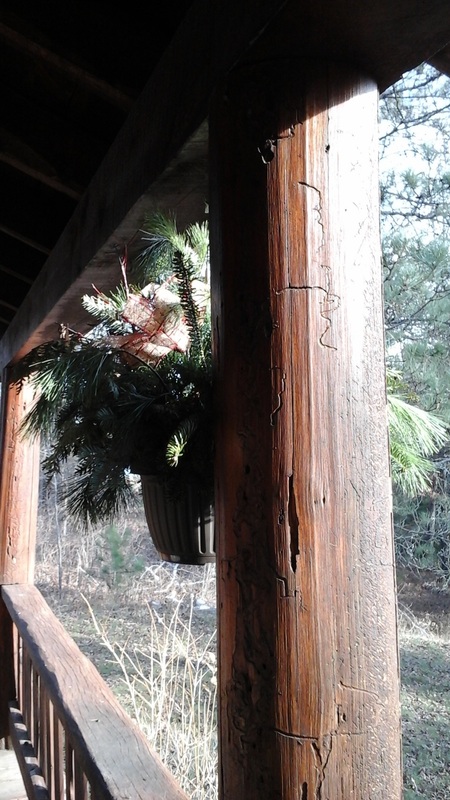 Time to clear the lakeside porch. Hanging flower pots , lawn chairs, and my fleece washing pots have all been removed and stored. The porch was swept, and this week windows will be washed. 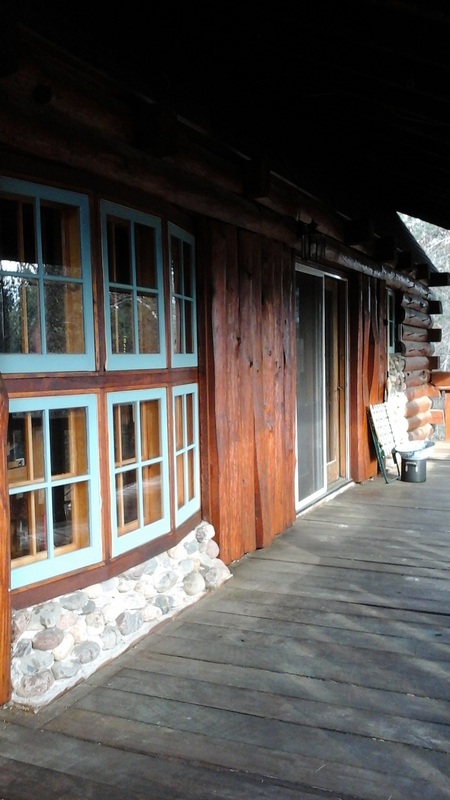 Storm windows were put on all the windows,… this lakeside window is to my weaving studio. While in town a couple days ago I saw hanging pots filled with pine boughs and brought one home to add a little winter cheer to my view from the kitchen window. I’ll be picking up a 24″ wreath for the entry door, and a 36″ wreath for the garage doors, the day before Thanksgiving. They add a nice, cozy touch to home/studio. Tape loom by J.K. Seidel. I’ve had a tape weaving book on the Amazon wish list for some time. 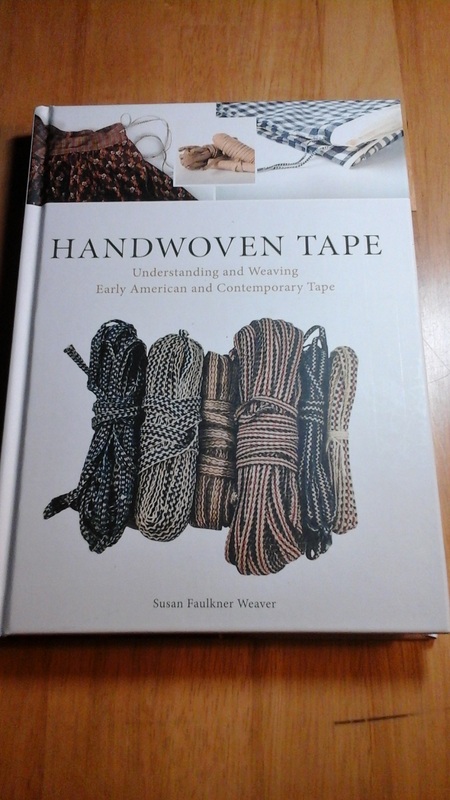 The release date is Dec. 28, 2016 for “Handwoven Tape: Understanding and Weaving Early American and Contemporary Tape” by Susan Faulkner Weaver. 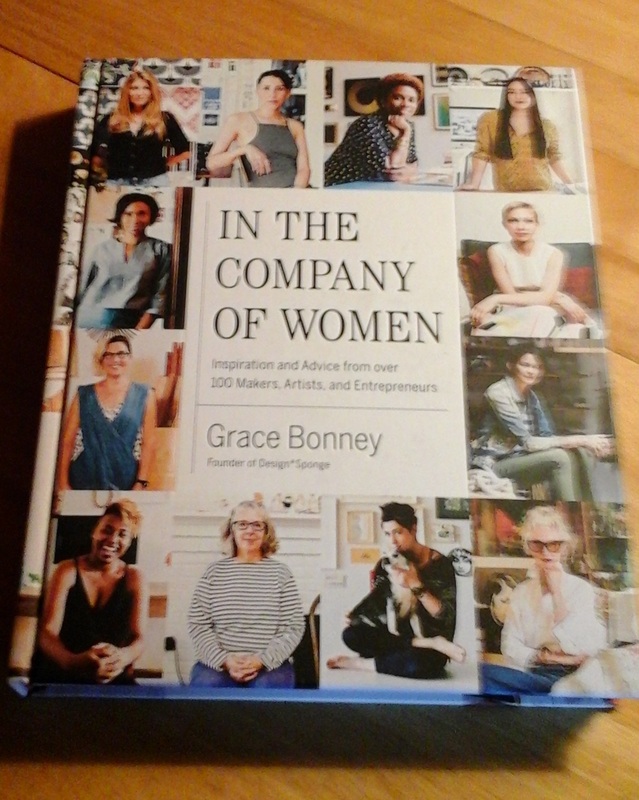 One evening I saw an email come in from WeavingSalesAds for a tape loom, so in anticipation of this book, I bought it. It’s a lovely little loom, from J.K. Seidel Tape Looms. Cotton band woven on Glimakra bandloom. At long last, I finally wove off the cotton band I had originally set up on my Glimakra bandloom. It’s time to design stripes for a new band using the same colors in a different configuration. I’m going to be adding a trapeze to my studio equipment and will use the bands for tying the uprights to the looms. I have sewing to do! 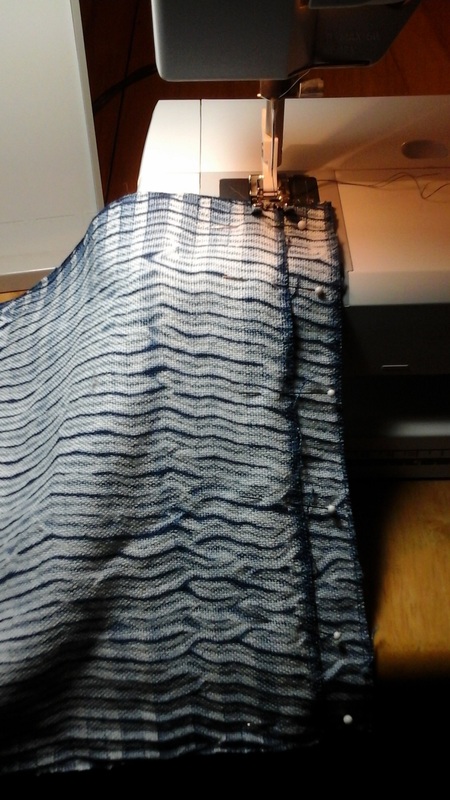 Not only finishing on some handwovens, but there are valances/curtains to make, quilts begun many years ago that I would like to get back to, and I may venture back into making simple pieces of clothing. All this, of course, is after the wood is split and stacked. Preparing for winter is often practical things like those I mentioned,… wood, matches, candles, oil lamps, food, water, pet needs. I have a long winter ahead of me,… building a fire every morning in the woodburning range in the kitchen, feeding it wood through the day and evening, carrying ashes out, shoveling snow, raking snow off the roof valleys and moving it, keeping paths open to the LP tank and the woodshed, along with the usual tasks. Winter preparations also include my weaving, threads/yarns to weave with. I’m nearly out of Bockens 16/2 cotton, but still have cones of 16/2 from Lunatic Fringe. Fleece to process (two new Gotland fleeces just arrived) for spinning, not to mention several Icelandic fleeces stashed away. I have some knitting projects half-done (or more) that need completing, before starting any new ones. Books to learn from are always good. These are recent additions! My spinning so far has been hoping the yarn I spin will work for the knit project I want to make, so far, cowls. 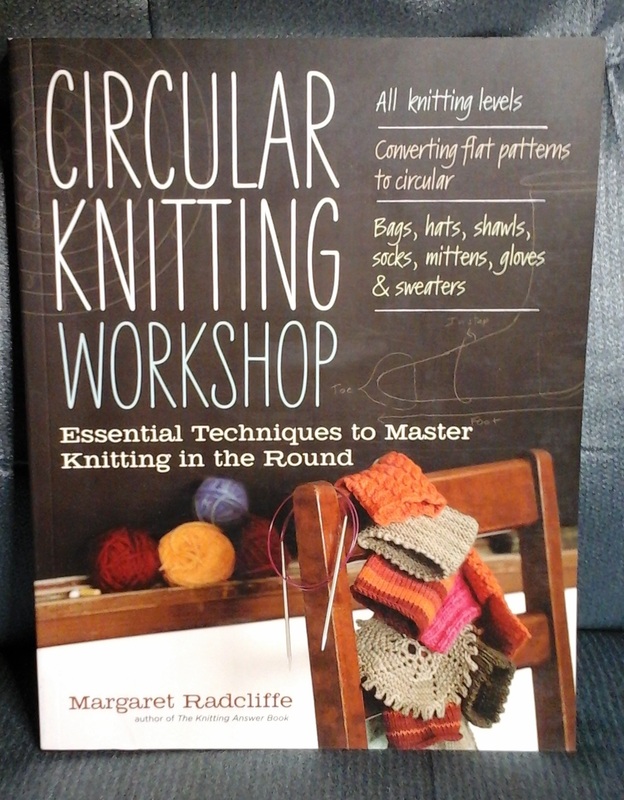 It’s time to learn more so I can hopefully spin what I need for perhaps a sweater? We’ll see! All my knitting in previous years was on straight needles. 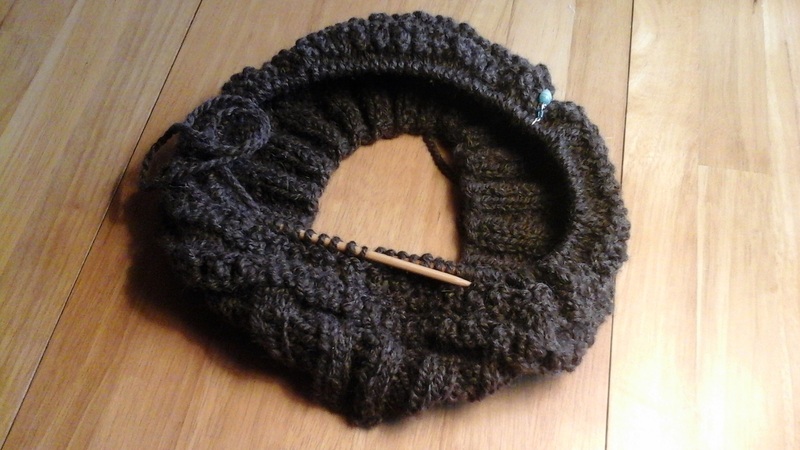 I finally tried circular needles on the cowl pattern I have knit a few times. But I have questions and need answers. Hopefully answers will be found in this book. My father had an aunt who, like his parents, emigrated here from Norway. We met with her one day and I tape recorded the conversation during which she reminisced about life in Norway before they came to the U.S. 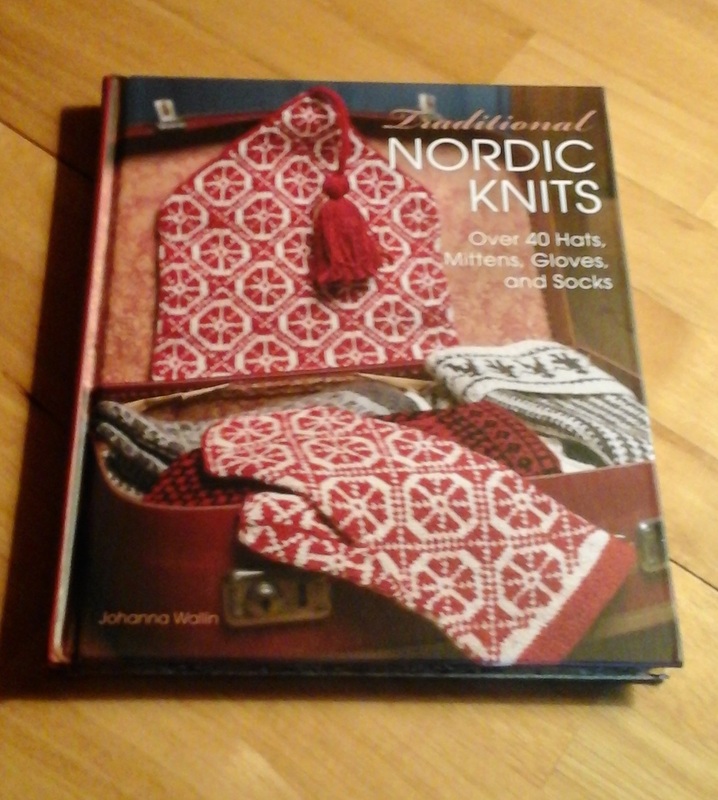 I recall that day she told us she had knit over 100 “Norwegian” sweaters. 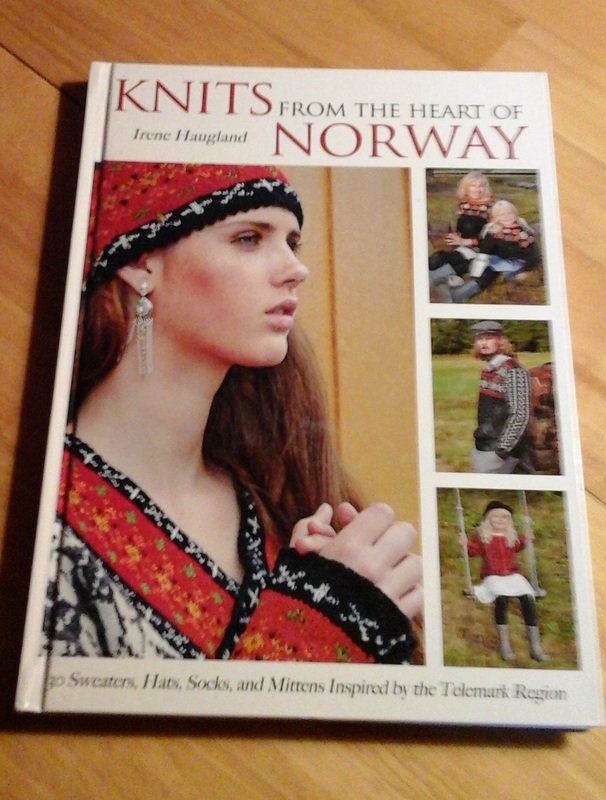 That planted the seed in me to one day learn to knit Norwegian style. So I added these two books to my growing stash of books on the subject. Good incentive to get those unfinished projects done! I’m also reading “The French Chef in America: Julia Child’s Second Act” by Alex Prud’homme, co-author with Julia Child of “My Life in France.” Sorry, no photo. Reading takes me longer these days, cataracts are becoming noticeable, particularly in my right eye. They are interfering with my weaving, and I avoid any driving at dusk or after dark. I’m hoping they can be removed before too long, must wait to see what the surgeon and insurance company have to say. 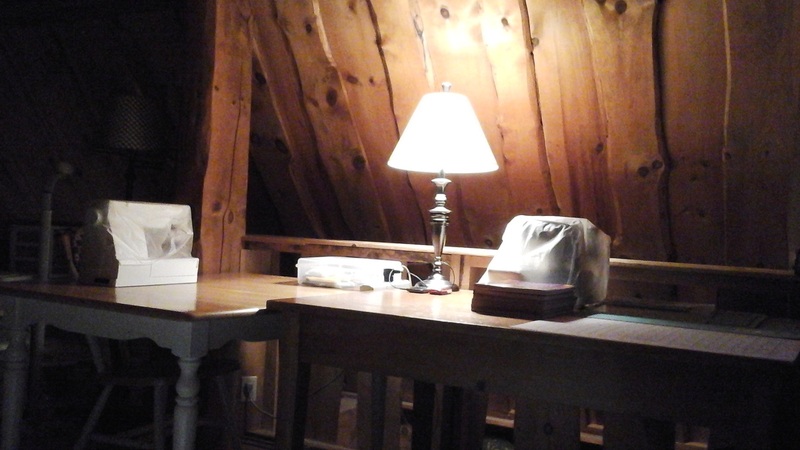 I do what I can, whether outdoor work, wood, weaving, reading, or getting back to decluttering and packing. All in good time. And if all goes well, I’ll be ready for another long northwoods winter with more than enough to keep me pleasantly occupied! Missing the Studio,… I’m Back! 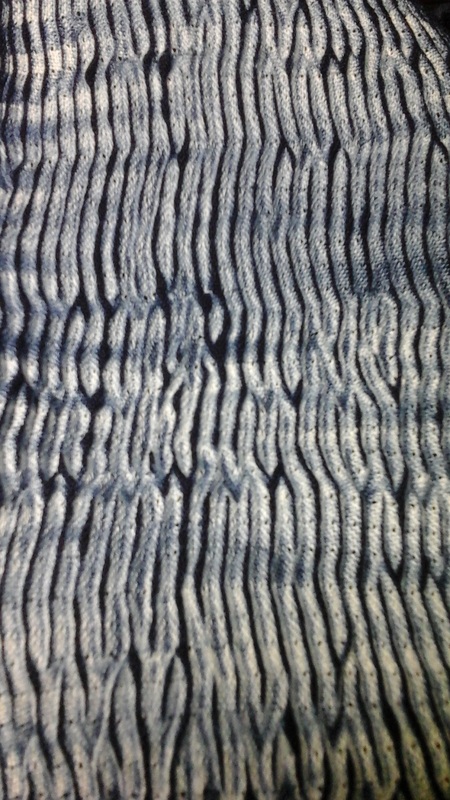 Woven shibori, fresh off the loom. 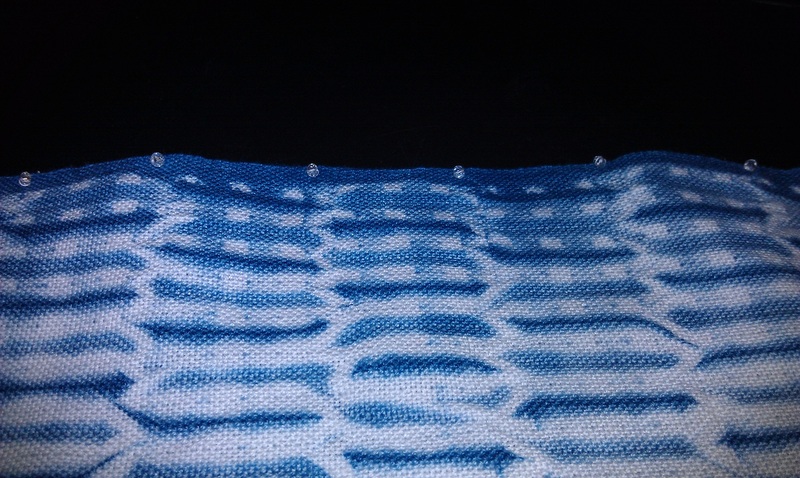 Last Thursday or so, another woven shibori scarf finally came off the loom. I also found another, in a plastic bag, which had a pattern row treadling error. The offending thread was removed, and a new plain weave row was needle-woven in. Thank goodness for my Ott floor lamp with magnifier! Cataracts are making themselves known and without the magnifier, I would not have been able to see well enough to replace that row. Both were now ready for the next step in the woven shibori process. The start of gathering pattern threads on first long edge of scarf. 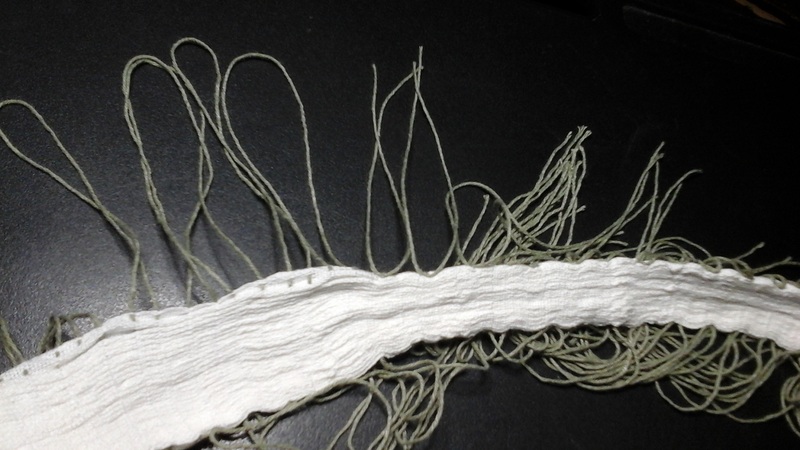 Before dyeing, the pattern threads (green threads, above in pic) were gathered along one long edge, then the loops on that edge are clipped and tied into tight knots. Gathers made, now tying knots. When one side was completed the same was done along the other long edge, making sure both gathers and knots were very tight, as that is the “resist” to keep the dye from penetrating through. 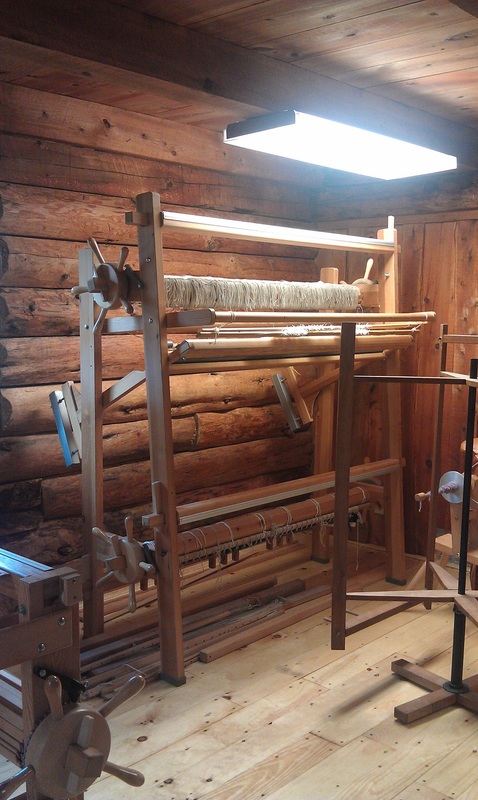 This warp is 10″ wide at the reed, but when ready to dye was less than 1″ wide. Saturday morning, a new indigo vat was mixed. It was made with warm water, causing it to produce a great amount of “flower” which I had to continually be removing. In the video above, made tonight, there is less flower as the temperature has gone down, both outside and inside my home/studio. I’m stirring it twice daily and it continues to have both flower and the green color that you want in the vat. Dyed scarves and squares air-drying (with help of fan) after indigo dye vat. 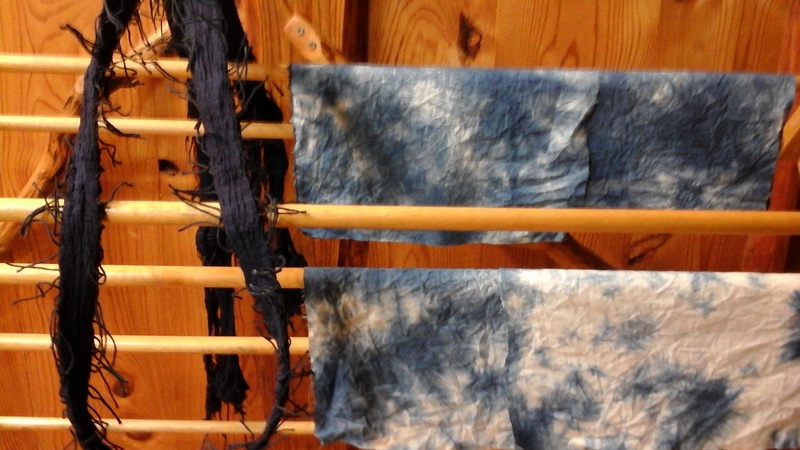 After giving it time to work, I tested color with four squares of PFD cotton, followed by two woven shibori scarves. I’m keeping those squares, setting them aside for a future, but as yet unknown, project. Right after clipping knots on one edge, pulling pattern threads out from other side, revealing the pattern. 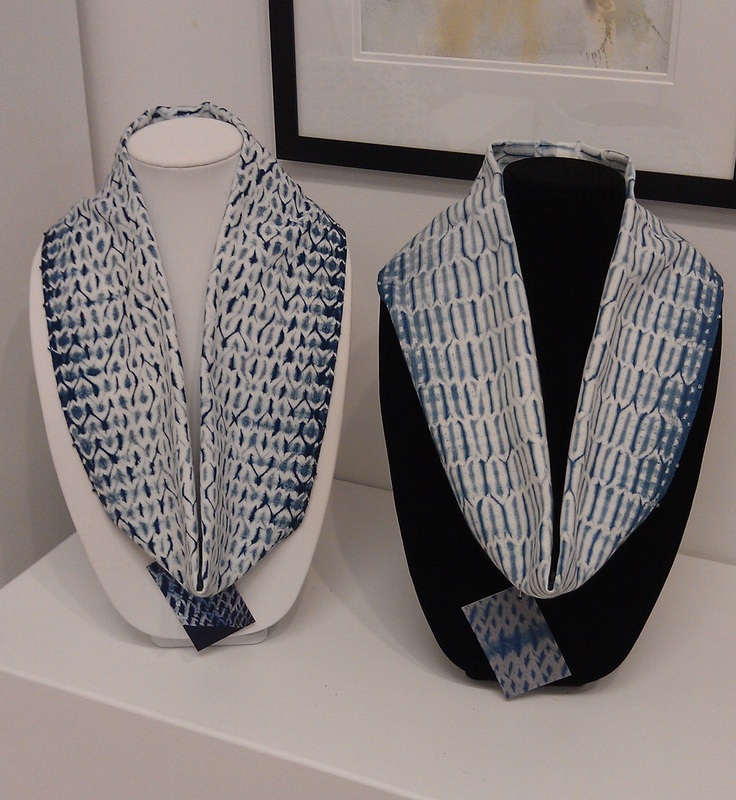 When the woven shibori scarves were almost completely dry, they were opened to reveal the pattern. They are about to be washed, well-rinsed, then air-dry again, followed by pressing and finishing. I am hoping one will be a scarf with fringe, the other will be a cowl. I had let guild members know I would be dyeing that morning, and Deb and Liz dropped by to watch the indigo dye process, and Louise (friend and guild member) was here to also indigo dye a few pieces. There is still a bit of warp left on the loom, which I am weaving off in plain weave for pieces to hand-stitch designs on, along the lines of dragonflies, bamboo, done previously. Meanwhile, I am deciding on the new warp,… more scarves? Less width for narrower scarves? Or a few inches wider for a first garment? I’ve been collecting a few patterns, and researching width needed for panels, and decisions on design, and pattern(s), in other words, threading and tie-up, need to be made. 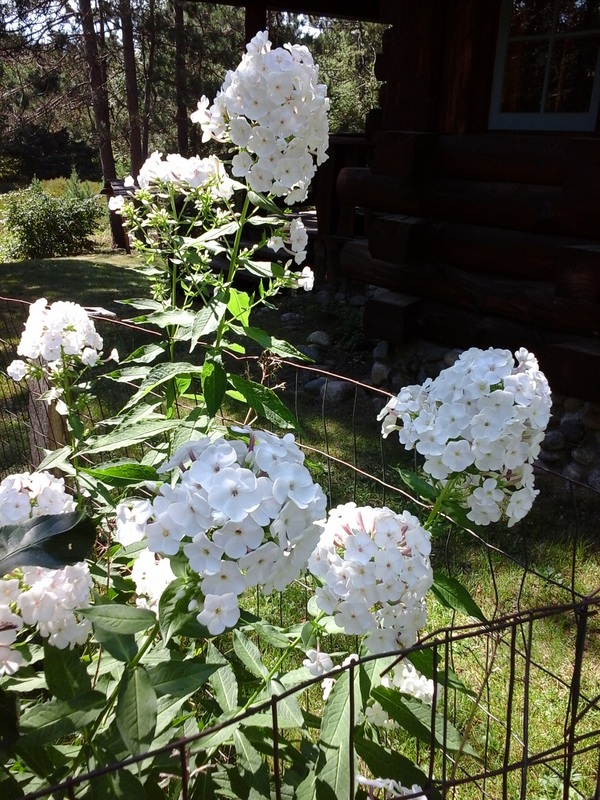 White phlox growing near the apple tree. Meanwhile, outside the studio, it has been a fairly rainy summer and early fall. The phlox were better than usual this year, their beauty and fragrance take me immediately back to my childhood, and the phlox my mother had in a flowerbed. Toadstool, early autumn. Poisonous I was warned. 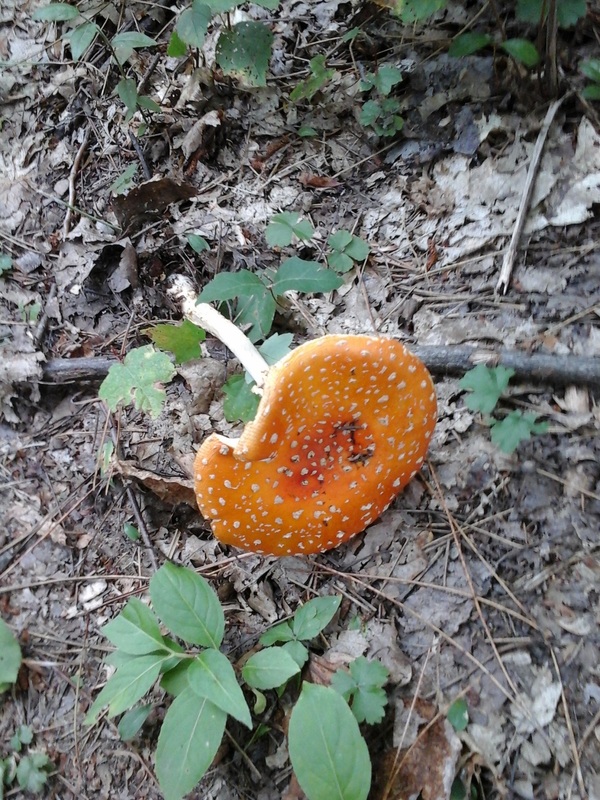 Another result of these rainy weeks has been more than the usual number of toadstools this year. I posted this photo on Facebook, and at least a couple people warned me it was poisonous. I never pick fungi of any kind, not being a fan (except for dyeing in future), and leave them for the wildlife that can safely eat them. Speaking of wildlife, Wild Instincts called me last Friday evening, could I pick up (and possibly catch) a seagull with a fishing lure through its beak. Certainly, and off I went. Before arriving, a call came to let me know the gull had been caught. Thankfully, Mark N., rehabber, was able to quickly cut the small curved end of the lure, pull the larger part out of the beak. The gull was only slightly underweight, and it was placed in a cage and put in a quiet space to recover and be cared for. And where have I been since February? I was emptying cupboards, drawers, closets, boxes, going through endless amounts of “stuff,” over 35 years worth,… giving some away, tossing quite a bit, and packing boxes. Two family members moved out in early June so then I had the adjustment to make of living alone, again. I am not done going through everything, summer flew by, and the year is nearing its end. The new plan is over the winter, finish going through things, packing, finishing up work on the house, and do my best to be ready to list the house by May 1st, 2017. With all this, very little weaving was getting done, which was expected. I had been missing weaving and dyeing, and will be making it a priority again. I’ve joined ArtizanMade and will also be part of the ArtizanMade Market so I’m looking forward to a more time in the studio. And not is it autumn! There is a woodburning range in my kitchen, providing about 60% of my heat from mid-to-late October through mid-April, except there is no firewood ready! I had someone here last week to cut the 8′ lengths of wood (3-4 loggers cords) for me. 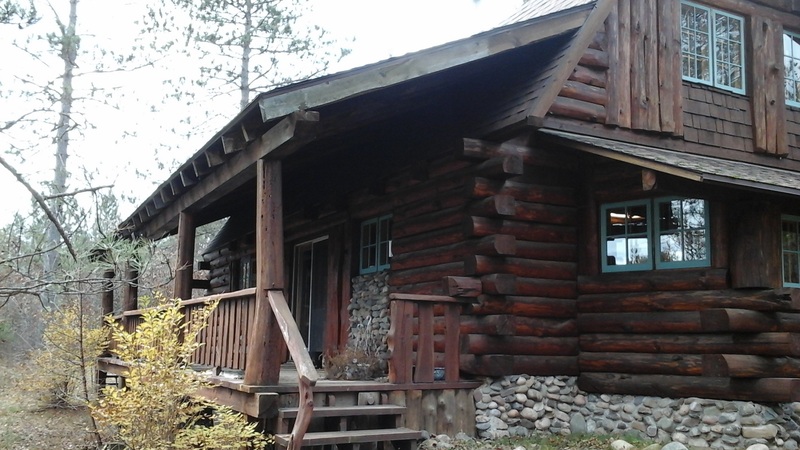 Now it is my turn to spend a lot of time outdoors at the log splitter, and stacking wood in racks in my garage, and then the woodshed. A year ago, our first light snow was October 16th! That gives me very little time to get a big job done. I’ll be back in a day or two with photos of the finished scarves, and the tiny bit of recent progress with the Regina loom. See you then! It has been a couple weeks of challenges,… design, dyeing, time, energy, mechanical, and more. After the circle/cowl scarves were finished and delivered to Artistree Gallery, along with the sachets, it was time to weave the custom scarf ordered by a woman in WI. She had seen a different “bamboo” scarf during the fall art tour, and after looking at a number of scarves, decided she wanted one with a bamboo design on it. The photo above, “Bamboo 2” was just completed and mailed this week. Weaving was begun, hemstitching, the border with a center area for the design to be hand-stitched on. Then the center plain weave, and repeat the border. 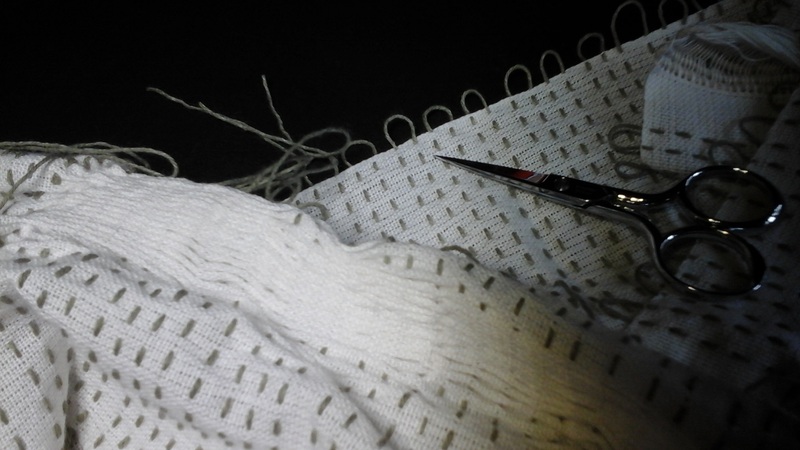 It takes awhile to hand-stitch the design, and even longer to gather/tie all those stitched lines. 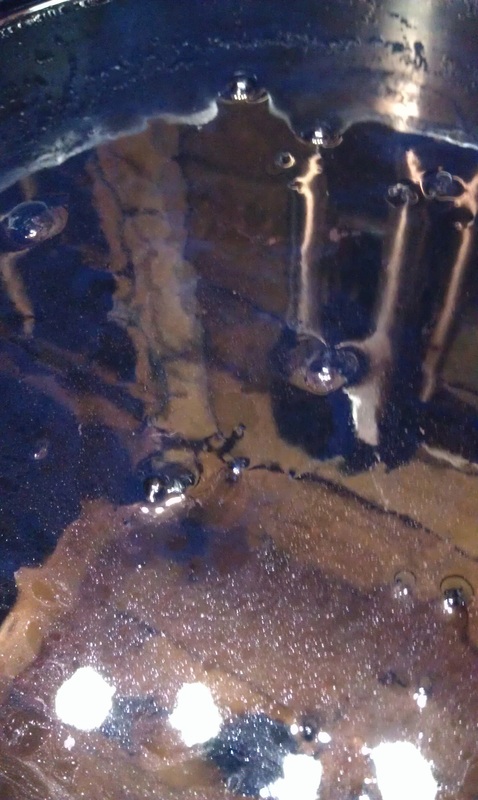 While working on this, I was also reviving the indigo vat by placing it (in a 5 gal. stainless steel pot) on the woodburning range in the kitchen to warm it up a bit, and added more indigo and Thiox, stirring it well a couple times that evening and letting it work overnight. 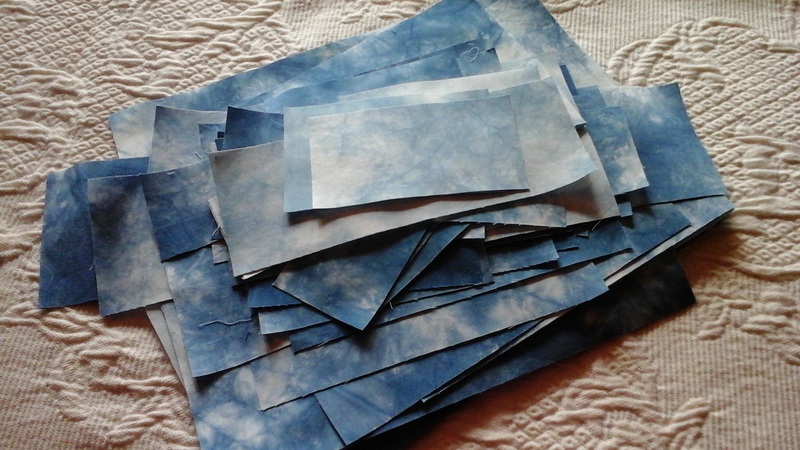 I’d forgotten how long, and it was a very long day and late evening, and finally ready to indigo dye the next morning. 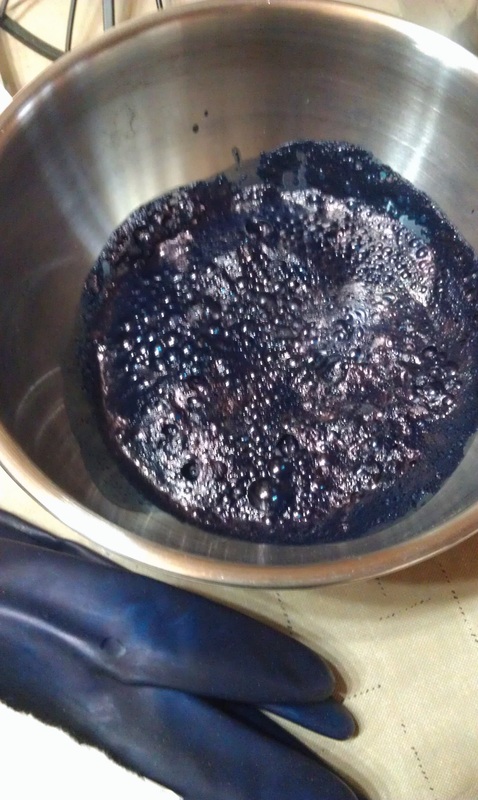 Indigo dye vat ready to go (flower removed). “Flower,” set aside in a bowl, and returned to the vat after dyeing done. The dyeing was done, three dips in the vat, and after giving it plenty of time to oxidize, it was rinsed, water squeezed out, and draped over a wood drying rack in front of a fan turned on high. By early evening, it was dry and I sat down with scissors and my new OttLite (LED with magnifier) which has been saving my eyesight, to very carefully snip the knots and pull the pattern threads out. Then down to wash and rinse (multiple rinses), and let it dry overnight. In the morning the scarf was pressed and I took it to the gallery to hand-twist fringe while I spent the day working there. Mid-afternoon a lot of sleet came down, and after the rug hooking group left, I closed up and went home to finish the fringe. Another pressing in the morning, and the scarf was mailed to the client. I received an email from her, she is VERY happy with the scarf and will be wearing it over the upcoming holidays. Enjoy wearing it, Jill! I took a couple days off after the intensive hours on that scarf, and the other day set up the sock machine in the afternoon. 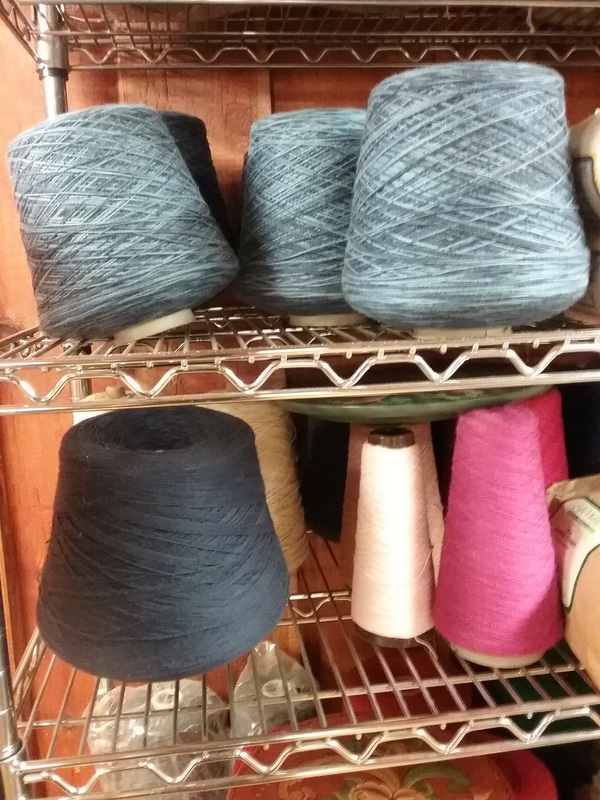 I had the machine ready, the lights focused down on the needles, the yarn standing by, the scrap yarn threaded, was about to turn the crank to start a sock, when,… the lights went out! The timing was incredible. It was all put away and I took a nap. This morning I set it all up again, knowing I had to work on an issue with the tension knob,… the last time I made socks, the last two pairs ended up too big and were returned to me this fall (local guild member). I’d made them the same number of rows, leg and foot, as I always do for her (repeat customer). So I need to figure out if the whole knob had somehow been turned so the old setting wasn’t going to work? If so, I’d need to figure out where it should be set to achieve the stitch size/rows for each size (S, M, L, X-L). I wasn’t expecting the sock machine to have every problem it had ever had plus a new one. The machine was taken apart three times today, cleaned, greased, reassembled, new needles swapped in for any that showed a problem. But this new problem? When I start the heel, the yarn doesn’t knit and all the needles for 3″ or so throw the stitches off, all in the blink of an eye. I have no clue what is causing it and I can’t do heels/toes until it is resolved. Tonight I described it on a sock machine list in hope someone might have an idea. I’ll be back at the sock machine in the morning,… I think we need a little time away from each other tonight. After those sock orders are finally completed and mailed/delivered, I’ll visit my father again for a few days. We are hoping his two fractures will be healed by Jan. 4th, and he can leave the splint off, and return to his activities. Glimakra Regina tapestry/rug loom in the studio. When I return home, I’ll be focusing first on the online tapestry weaving class I am participating in, taught by Rebecca Mezoff. The next time you see a photo of this loom, my tapestry “homework” will be on it, something I am really looking forward to. In winter, I like to stay home where it is warm and cozy, there are fewer distractions and outside deadlines, and it is a good time for me to delve into new areas of weaving or other fiber areas. 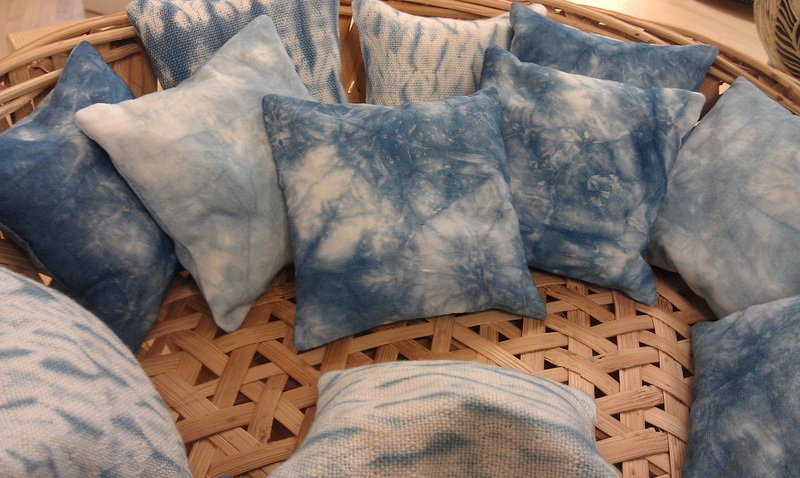 It will also be a good time to take woven shibori in new directions, and there are many ideas and plans for that. And I’m not forgetting the Norwegian style weaving I need to get back to, including drawloom. I have weaving to do for Shuttle Works Studio (on Big Cartel), Artistree Gallery, and for TAFA. 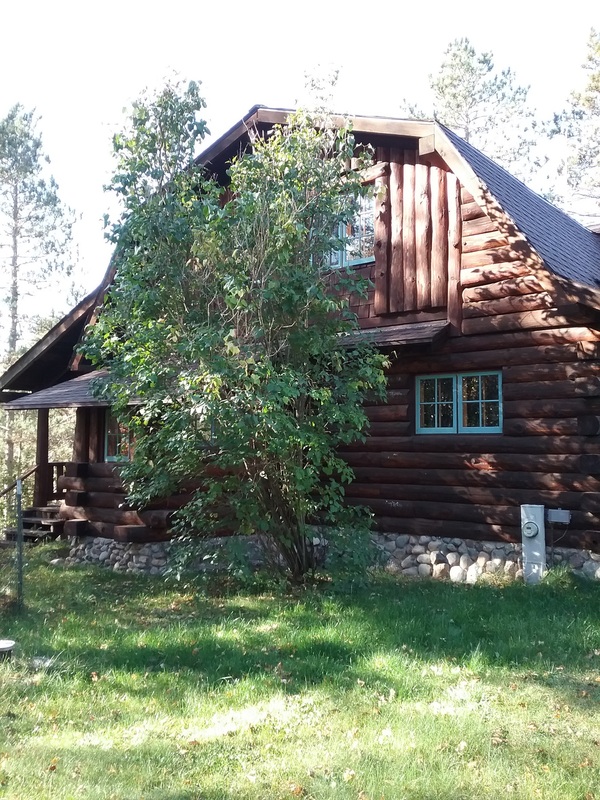 As part of the changes I expect to take place in 2016, I took myself off the Northwoods Art Tour, my participation in Art Gypsies and Artistree Gallery are undecided, and I am re-thinking my goals. A couple days ago I went to one of those Facebook “game” pages where you type in your name and it gives a word for the coming year,… my word was CHANGE. How fitting! We are also going to be working on the house again,… kitchen cupboards and counters will be refinished, a new kitchen sink put in, and hopefully new lighting. Upstairs, the floors will be taken up, planed, stained, and finished. 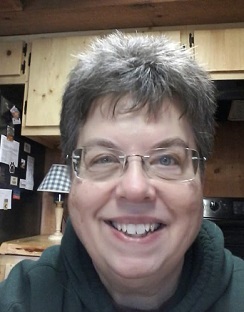 I turned 65 a few weeks ago (how did that happen! ), and decided I need to simplify some areas of my life to lessen self-inflicted stress, make upcoming changes easier, and make my creative life more pleasant. In late September I started sponsoring a 14 year old Tibetan nun through the Tibetan Nuns Project. A couple weeks ago I began sponsoring a second Tibetan nun, this young woman is in her mid-20’s. I am a firm believer in sharing blessings, and through TNP, these women and girls have safe housing, food, clothes, and are getting an education in an area of the world where very few females are provided that. I am happy to give up a few extras each month to make this commitment to them and TNP, and I’m hoping we will be able to exchange an occasional letter. For now, their photos and information hang on a bulletin board in my studio, where I see them daily. They are a good reminder to be thankful for what I have, to give, and to stay focused on what is important in life. There is much to look forward to in 2016! 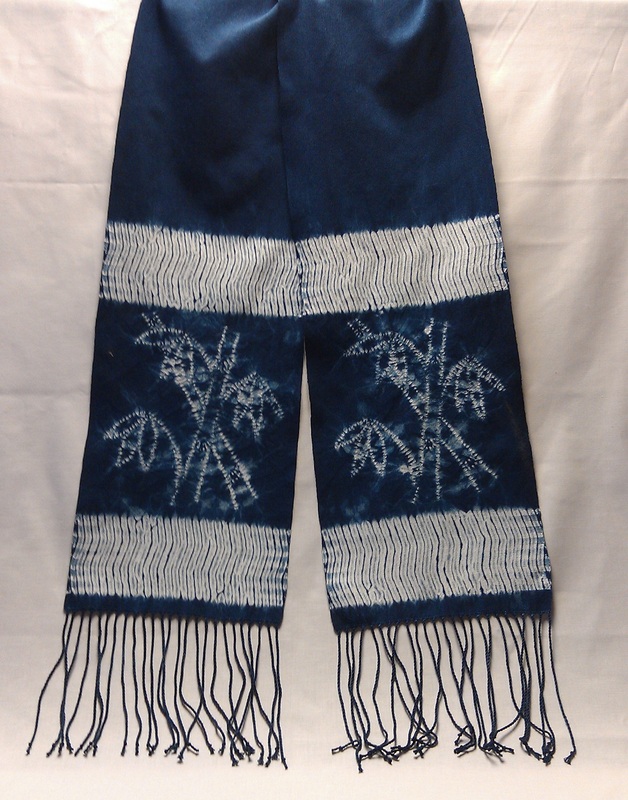 It is the first week of December, and thewoven shibori scarves and sachets for the Artistree Gallery Holiday Art Bazaar were completed and delivered. Saturday at the gallery was enjoyable, with great art, great food, music, and even a visit from Santa! I had been moving along, making progress on the scarves, was thinking about adding small beads to the long edges, had muslin and indigo dyed cotton for sachets as well as a good supply of dried lavender and a lavender/rose petal mix,… and the phone rang. My father had fallen and fractured two bones in his left arm, the radius above his wrist, and middle finger in his hand. I drove down a day or so later when the roads would be plowed (they had a good snowstorm 250 miles south of where I live), and spent two weeks with him, taking him to appointments for x-rays and a better splint, and a week later more x-rays to make sure the bones had started to heal. 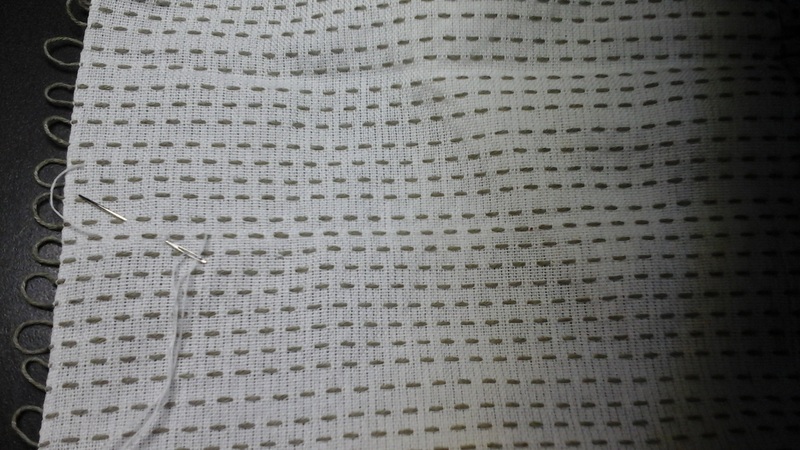 Adding clear glass beads to the edges of one scarf. 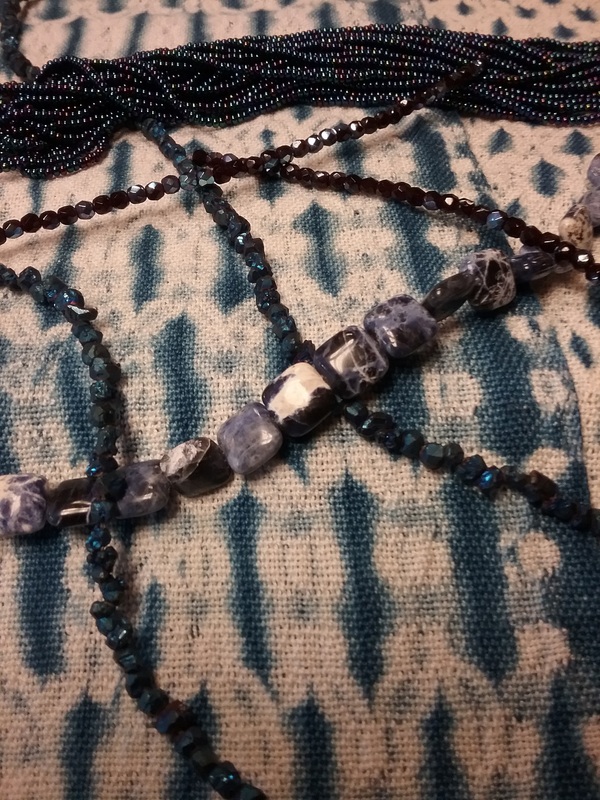 So, in-between helping him with cooking, home, laundry, errands, and so on, I visited Michael’s and bought dark indigo colored and clear glass beads, and began stitching them to the scarves. Two evenings before driving home, I could no longer see the holes in the small clear beads. So on my way north, I stopped at a Michael’s and bought an OttLite floor lamp, LED lights around a magnifier. What a difference that has made! 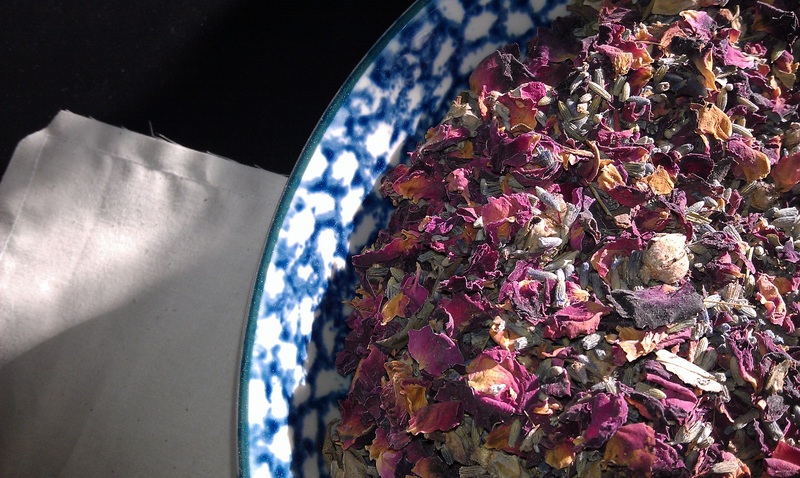 Dried lavender/rose petal mix for sachets. 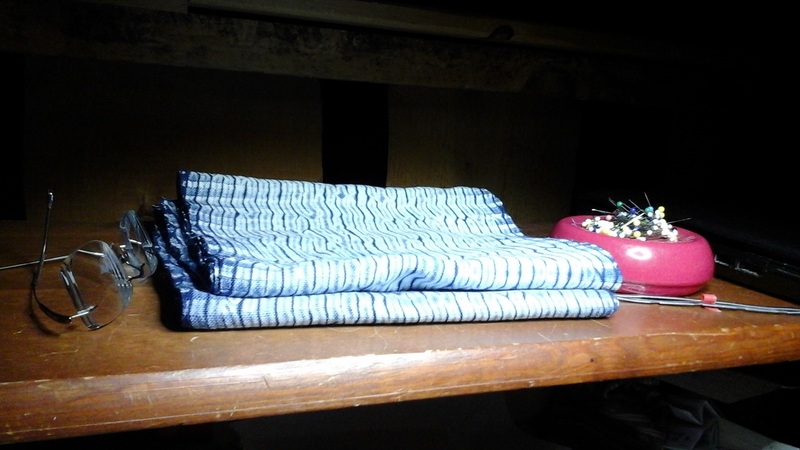 I finished sewing on the last dozen beads, sewed and filled the muslin squares, cut the woven shibori and indigo-dyed cotton squares for the sachets, assembled them, and hand-stitched them closed. The fragrance is wonderful! Fragrant lavender and lavender/rose petal sachets. 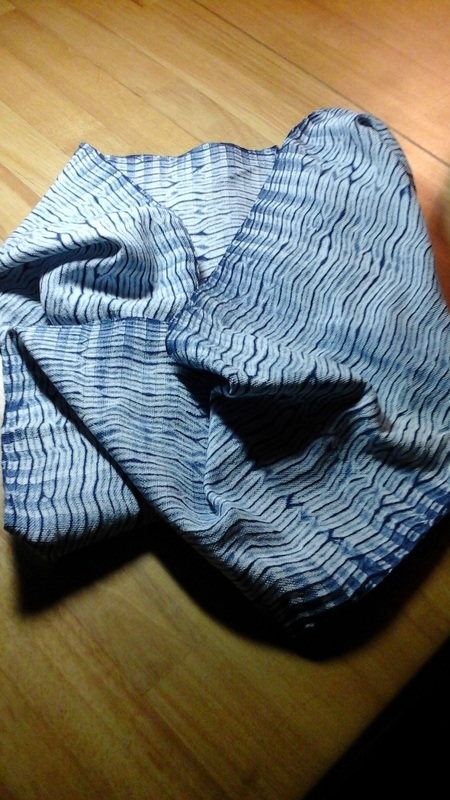 Now, I’ve begun work on the custom orders, one woven shibori “bamboo” scarf, as well as several pairs of wool socks. I have less than two weeks to complete everything and get them all in the mail. 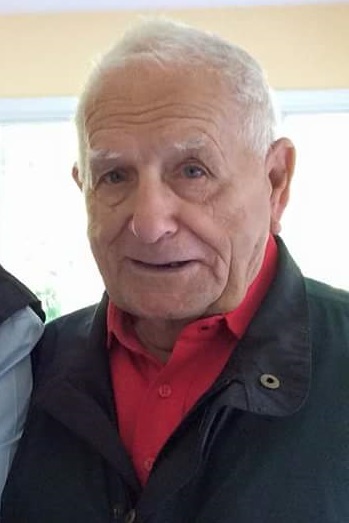 Then I return to spend Christmas and New Years with my 88 year old father, visit the clinic again and hopefully x-rays will show his arm has healed and he can take the splint off. I’ll return home early in January, sit down at the Regina tapestry loom, and do some serious weaving and learning,… winter is a good time for that! There are changes coming up, big changes in 2016, and it’s time to make plans, detailed lists, declutter my home and life, and set new goals. Exciting times ahead!